While eCommerce site owners find different ways to increase their conversion rates, they seem to know less about the impact of product pages on CRO. Your product page is where a visitor becomes your customer. But ironically product pages have the highest exit rates. Your products could have some of the most enticing features to stand out from your competitors but only an ideal design can help you realize your true sales potential. 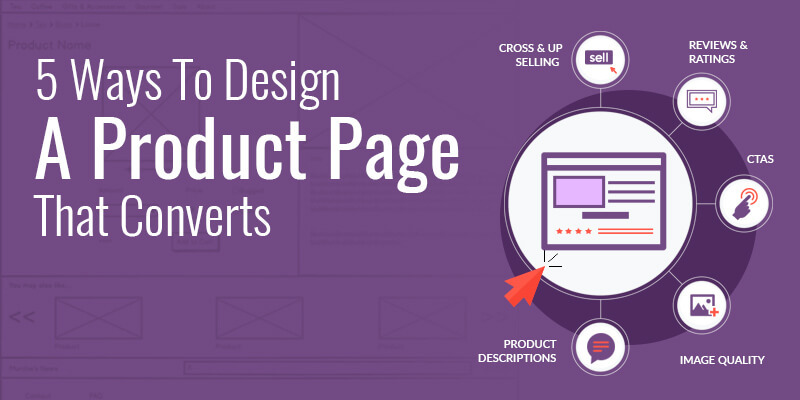 Keeping this in mind, we spoke to our wonderful design team to get some insight on some of the most important design elements that will boost product page conversions. When it comes to a product page, you may have several ideas (like content, images, CTAs, videos, ads, popup, colors etc) that you think would enhance your page. But with all these creativity, you forget to focus on the goal of your product page – make customers buy! The first impression for a customer depends on the clarity and quality of your product images. This is where a customer decides to buy a product. Moreover, your responsibility towards images get bigger when your products hold a larger price tag, as bad, low resolution images can make your users more indecisive. Made is one of the best examples- using both high resolution and quality images to woo customers. Product images and descriptions go hand in hand where both require equal attention. When your product descriptions are poorly written, lengthy, and do not portray the core features of your product, users are more likely to leave your website. Most eCommerce sites are not aware of the SEO impact of product descriptions. When your product descriptions are keyword rich, concise and quality content, it can help you rank well in search engines like Google. When I searched for Jeffrey Archer’s ‘Best Kept Secret’, the top results were from Amazon and Pan Macmillan although the book is listed on Jeffrey’s official website http://www.jeffreyarcherbooks.com. This clearly shows how product pages can dominate SERP. Keep product descriptions short with larger, legible font. Another important element of writing a good product description is the right usage of adjectives. Such elements help you to showcase the essence of your product. Remember to build content based on your buyer persona, as descriptions need to connect with the buyer’s needs. Now, users are impressed with your product image and convinced with your product description. Cross-selling and up-selling are a winning strategy that can be included in a product page in order to increase your sales. According to research by Forrester, product recommendations can earn additional revenue of 10% to 30% for your eCommerce site. When you up-sell, you offer an upgraded version of the buyer’s preferred product. You can showcase similar products which are more expensive and superior. Similarly, Cross-selling is when you tempt your customers to buy more products along with their existing purchase. It works like add-ons where customers wouldn’t mind spending few extra bucks to make their purchase look complete. Hence, it’s important that you plan your cross-selling/up-selling techniques in different aspects of your product page. In the end, all that matters is to convince customers for better sales! According to stats, 85% of consumers buy products based on product reviews. When customers find product reviews and ratings from similar users, it has a greater influence on their buying decision- especially when they’re placed on your product page. Moreover, they build trust and add credibility to your brand. Product reviews and ratings are more or less like a social proof. It’s also a success metric by which you can measure the success or failure of your product. Why? Because when you encourage customers to review your products, it helps you to understand how well your brand is being perceived by the end users. This way, you can bring in minor/major changes which in turn build your reputation among your customers. There are different tools and many possible ways available in the market where you can get customers to review and rate your products. Such tools help you send automated and personalized emails to your customers based on their purchase history or browsing behavior. Having read all these important and useful tips for your product page, you should be ready to make changes and improve your CRO. Our expert Magento CRO team can audit and provide advice from our web designers specifically for your site. Talk to us anytime as we’re available round the clock to help you design product pages that convert better!